Last week we shared Part I, where I had been arrested in an anti-nuclear action in the summer of 1990 at Wurtsmith Air Force Base near Bay City in Michigan. After being arrested, I refused to go to the court date and went underground for several months after Federal Agents came to my house to arrest me. During this time in 1990, there was the US military build-up against Iraq, because of its invasion of Kuwait. The US military was deploying soldiers and military equipment to Saudi Arabia that would eventually result in a January 1991 US invasion of Iraq. 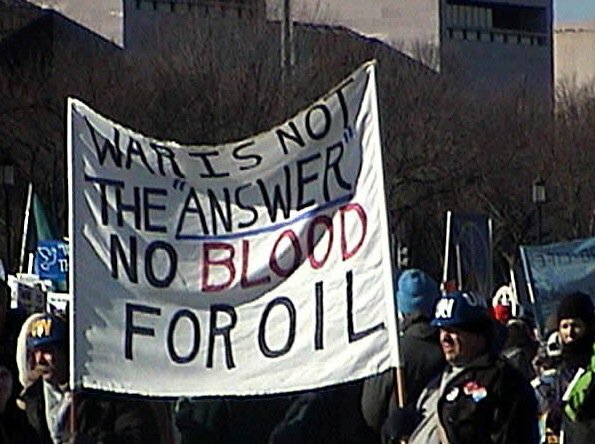 Because of the US military build-up, many of us were organizing against a US military invasion and holding demonstrations once a week in front of the US Federal Building in downtown Grand Rapids. In late November, I decided to participate in one of the demonstrations and within 10 minutes, I was arrested by Federal Agents working out of the Grand Rapids Federal Building. I spent the night in the Kent County Jail and went before a Federal Judge, with handcuffs and foot shackles. I was released later that day with a new court date set to appear before the US Federal Judge in Grand Rapids at a later date. I was eventually found guilty and was sentenced to do 100 hours of community service. At the time I was volunteering for Gleaners and the courts allowed me to use that as my community service, resulting in no real interruption in my life. Ironically, the people who had been arrested with me in August at Wurtsmith Air Force Base and went to their court dates, received 3 months in jail. The lesson learned for me was to not cooperate with the legal system when engaged in acts of resistance against US militarism. The following video appeared on GRTV, where WenJo Carlton interviewed me for her show, Something Else. We talked about the arrest, the consequences and the eventual invasion/war against Iraq. This entry was posted in Anti-Nuclear Movement, Anti-War/Anti-Imperialism and tagged anti-nuclear resistance in Grand Rapids, protest against US War in the Persian Gulf. Bookmark the permalink.